How many islands are in Great Salt Lake? Great Salt Lake has islands from small to large, from one corner of the lake to the other. But how many islands are there? The question is not as straightforward as one might think. Although there are 17 officially named islands, answers to the question typically range from zero to 15. It All Depends. . .
Great Salt Lake is in a closed basin, an area without any drainage outlet. The elevation of the lake’s surface changes continually, reflecting changes in weather and climate; heavy precipitation and low evaporation rates cause the lake level to rise, whereas drought and heat will result in a declining lake level. The lake level can change 2-plus feet a year, and because the basin floor slopes very gently, the shoreline advance or retreat can be a mile or more in certain areas. Great Salt Lake’s ups and downs have exceeded a 20-foot range in historical times. At high lake levels some islands submerge and new ones are created by the water enclosing higher topography. At low lake levels new islands emerge and some adjacent islands merge with each other or with the mainland. All islands become connected to the mainland during very low lake levels (e.g., 1963), and the maximum number of islands occurs during very high lake levels (e.g., 1873, 1986–87). A few examples illustrate how the number of islands changes with changing lake levels. Badger Island is submerged at historic high levels (4212 feet above sea level), and Goose Island in Farmington Bay is submerged at the average historical lake level of 4200 feet. Strongs Knob and Stansbury Island, technically peninsulas, are tied to the mainland by dry land until the lake level is a few feet higher than average. Some islands divide into multiple islands at higher lake levels. Strongs Knob spawns an islet or two at higher levels, as does Cub Island, splitting into two smaller islets—Greater Cub and Lesser Cub. 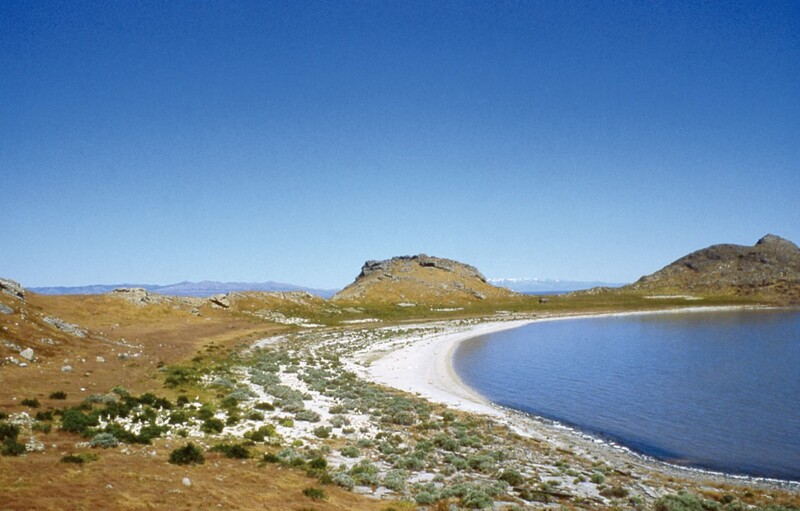 Antelope Island is a peninsula at lake levels below average. 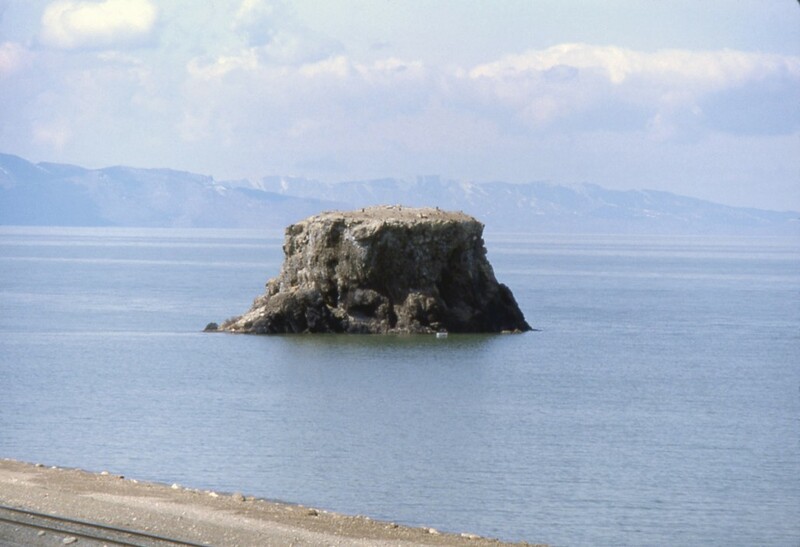 Egg Island and White Rock were connected to Antelope Island during the lowest historical lake level (4191.35 feet). Carrington, Badger, Hat, and Stansbury Islands all combine during low lake levels by way of sand bars. So, discrepancies in the reported number of islands are to be expected, depending on the level of the lake at the time of counting. The 11 most commonly cited islands are Antelope, Badger, Carrington, Cub, Dolphin, Egg, Fremont, Gunnison, Hat, Stansbury, and Strongs Knob. Islands often left out of the count are Black Rock and White Rock, Browns and Goose in Farmington Bay, and the Bear River Bay islands of Rock and Goose (the other Goose Island). All 17 islands have official names recognized by the U.S. Board on Geographic Names (geonames.usgs.gov). 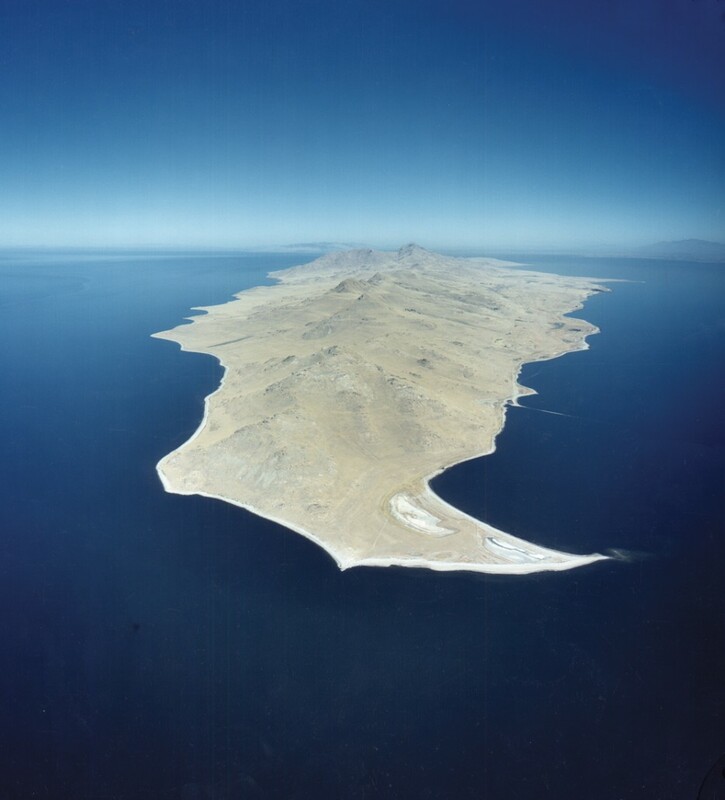 The major islands, such as Antelope, Stansbury, and Fremont Islands, as well as some of the minor islands, are actually mountain ranges that poke up above the lake. Great Salt Lake lies within the eastern part of the Basin and Range Province; because of the characteristic topography of this physiographic province—northsouth- trending isolated mountain ranges and adjacent valleys—Great Salt Lake hosts an unusually large number of islands. 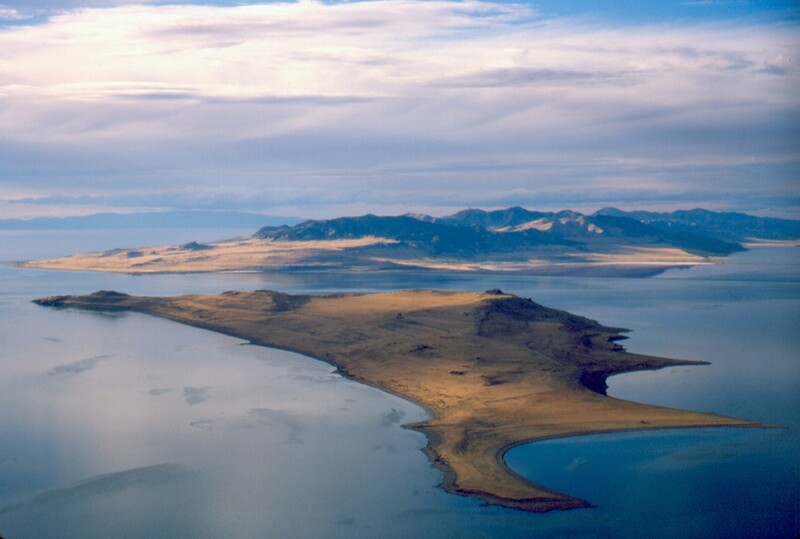 In contrast, the low-lying islands of Great Salt Lake’s eastern edge were constructed by the Bear, Jordan, and Weber Rivers. As the river channels migrate, erosion and deposition of sediment creates local high points. Additionally, liquefaction from large-magnitude earthquakes roils this soggy landscape, forming bumpy topography. Some of these low-lying islands are termed “knolls” rather than islands—for instance Rabbit, Cow Bay, and Round Knolls in Farmington Bay, and The Knoll by Bear River. An artificial but nonetheless remarkable island is Goose Egg in the Farmington Bay Waterfowl Management Area (not to be confused with the other two Goose Islands). Goose Egg is an island created from material generated in the May 1983 Rudd Canyon debris flow in northern Farmington in Davis County, which was hauled to and piled up in Farmington Bay. Another island of note is Mud Island, about 5 miles northeast of Fremont Island in Ogden Bay. For nearly a century it could be found labeled on maps, but no longer. Mud Island still makes an appearance between particular lake levels. In 1850, Captain Howard Stansbury and his exploration crew set up a station on Mud Island. He described it as a point of rocks surrounded by a mud plain . . . The State of Utah would recreate this situation in 1987, when the lake’s water was pumped into the west desert to control flooding associated with the lake’s historical highstand. Also, Little Mountain in Weber County was an island for awhile in the 17th century. This is the place where famed American explorer John C. Frémont summited for his first panoramic view of Great Salt Lake in 1843.